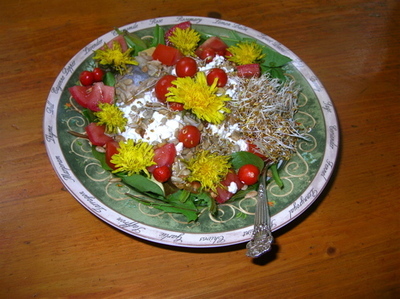 I always think about adding the dandelion weeds to my salads. If I didn’t tell the guys they wouldn’t notice at all. But living in the country and knowing where the weeds grow, I always wonder how they were “watered,” if you know what I mean. I have seen my own little dogs contribute. That makes the ones near the house out of the question anyway. Er, I see what you mean, Robin. But–do the dogs never–er–“water” the garden? Anyway, the way it’s been raining here, it wouldn’t matter how many dogs peed on the things, it would all have been washed off. Wish I had a fork! Enjoyed my visit to your featured blog! Glad you stopped by, Joey. I just checked out your website. Love it!! Welcome, Ginny. I have the distinct feeling that you live someplace warmer than I do; I won’t be having D-salad for a few weeds yet. That was the first time I’d tried the blooms, too, and I was quite pleased. Several kinds, actually, Rick. In this case at least, I’m sure lots of people think that’s several too many. Also, organic food supplements are the ones that will take over the market someday.